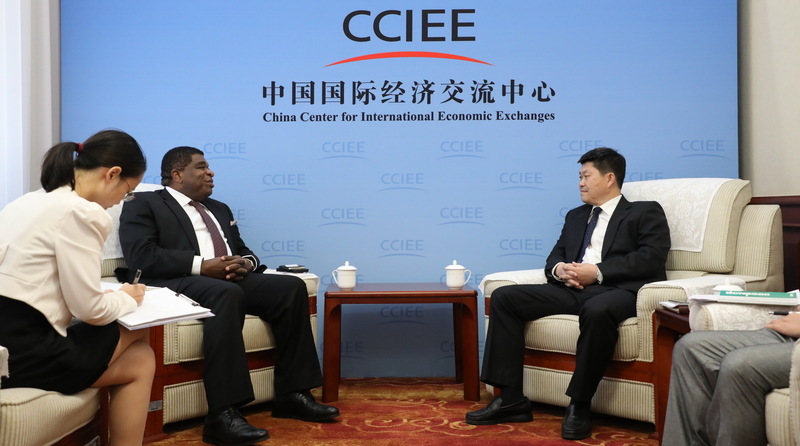 On September 11th, Martin Chungong, Secretary-General of the Inter-Parliamentary Union visited CCIEE and met with Xu Zhanchen, Director of the Department of Strategic Research. Officials from the Foreign Affairs Committee of the National People’s Congress and other researchers of CCIEE were also present at the meeting. Xu Zhanchen briefly introduced the positive progress of the Belt and Road Initiative since it was launched five years ago, emphasizing that the initiative is highly open, equal, inclusive, compatible and has great potential. The “Belt and Road” is not a small club designed for a few countries but open to all countries who are willing to participate on an equal footing and share the outcome together. The Belt and Road Initiative is not an alternative to the current global and regional mechanisms and promotes simultaneous development of rules and development. Chungong said that the Inter-Parliamentary Union is not just the largest international parliamentary organization in the world, but also the center of dialogue and parliamentary diplomacy between the legislative bodies of different political systems. Promoting sustainable development is the focus of the organization and the explanation of Mr. Xu is very helpful for other countries to better understand the Belt and Road initiative. The two sides also exchanged views on promoting the Belt and Road and sustainable development.